Young served as Mayor of Atlanta from 1982-1990, bringing jobs and seventy billion dollars in private investment to the City during a recession. Ambassador Young’s leadership, vision and global reputation were instrumental in bringing the Centennial Olympic Games to Atlanta in 1996. Ambassador Young retired from GoodWorks International, LLC, in 2012 after well over a decade of facilitating sustainable economic development in the business sectors of the Caribbean and Africa. 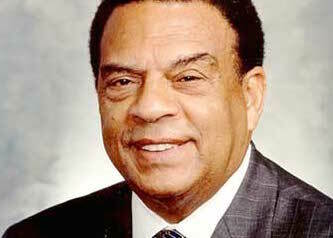 Ambassador Young has received honorary degrees from more than 100 universities and colleges in the U.S. and abroad. His many awards include the Presidential Medal of Freedom, the NAACP’s Springarn Medal and France’s Legion d’honneur, the nation’s greatest honor.